Lime Kiln Point State Park on San Juan Island. Photo Credit: Robert S. Harrison. There’s no denying that the San Juan Islands are lovely in the summer, but there’s a reason that the official Savor the San Juans celebration is in the fall. The fall harvest season is one of the best times to sample the local bounty of these picturesque islands and enjoy the best of the land and sea. Read on for a rundown on festival highlights and inside tips on making your visit a true treat for your taste buds. As part of the celebration, you can take a tour of local farms and learn about how the food you enjoy is produced. San Juan Island, Orcas Island and Lopez Island each have their own tours that gives visitors a chance to explore. Last year, attendees of different tours learned about greenhouse-grown salad and shellfish farming, got to meet heritage breeds of sheep and goats, and took a stroll through an edible food forest. If you’d like to learn the story behind your food, increase your knowledge of agriculture or just take in the rustic beauty of the farms that pepper the San Juan Islands, farm tours are an excellent option. Biking is a wonderful way to enjoy the natural beauty and breathtaking scenery of the San Juan Islands, and there are yearly events that bring the community together for special bike rides. After a day of biking, there’s nothing like feasting at one of the many incredible restaurants sprinkled around the three islands. They make up a gourmet haven of locally sourced favorites like seafood and farm-to-table produce, meats and cheeses. Local chefs get creative, adding in foraged ingredients and pairing meals with world-class wines for unforgettable dining experiences. A feast for your eyes also awaits! The Orcas Island Film Festival from October 6-9 and the Friday Harbor Film Festival November 3-5 will provide choice entertainment. The Orcas Island festival will feature thirty different feature-length films handpicked from globally renowned film festivals like Cannes, Telluride, New York and Seattle; while the Friday Harbor festival will focus on documentary films about the people, cultures and environment of the Pacific Rim. Whether you’re interested in a fresh look at local lands or the latest work from acclaimed filmmakers the world over, you can find what you seek at one of the San Juan Islands’ two film festivals this fall. All of the food you’ll find on the San Juan Islands is delicious, but some of it is also pretty unique. Pelindaba Lavender Farm has over 25 acres of lavender and over 200 lavender-based products, some of which are culinary. Pick up a lavender herb and spice rub to use on meat, try lavender peach chutney, score some lavender lemonade mix or indulge in lavender-infused chocolates. San Juan Island Sea Salt harvests sea salt using solar power and then infuses it with singular local flavors like bull kelp and smoked madrona bark. If you want to try a fun new flavor, these seasonings are just what the doctor ordered. Another rare find is the Mangalitsa pork raised on Orcas Island. Known as the “Kobe beef of pork,” this pig is prized throughout the world for its high-fat, marbled meat. The breed is only raised on a handful of farms in the U.S., so it’s lucky that’s it’s available nearby at restaurants on Orcas Island like the Inn at Ship Bay. The high fat content imparts this reddish pork with an intense, hearty flavor more reminiscent of a fine cut of beef than the low-fat “white” pork products many Americans are used to. The taste of the goat cheeses produced on the San Juan Islands change with the seasons, so if you like your goat cheese richly flavored, fall is the best time to come and try a taste. In springtime when the goats eat spring grass, the cheeses are fresh and creamy but as the grass matures, the flavor of the cheese follows suit. Fall goat cheese is intense, earthy and truly divine. Best of all, you won’t have to go far to find your cheese. Myers Creamery is on Orcas Island, Quail Croft is on San Juan Island and Sunnyfield Farm is on Lopez Island so no matter where you’re staying, delicious goat cheese is never far away. You can find these delicious cheeses at local shops and the three islands' farmers' markets. In celebration of the fall Savor the San Juans celebration, hotels, cottages, inns and bed and breakfasts across the islands are offering special discounts. Check out all of the lodging specials to find your home away from home on the Islands. No matter what sort of accommodations you’re looking for, you can find them on the San Juan Islands. 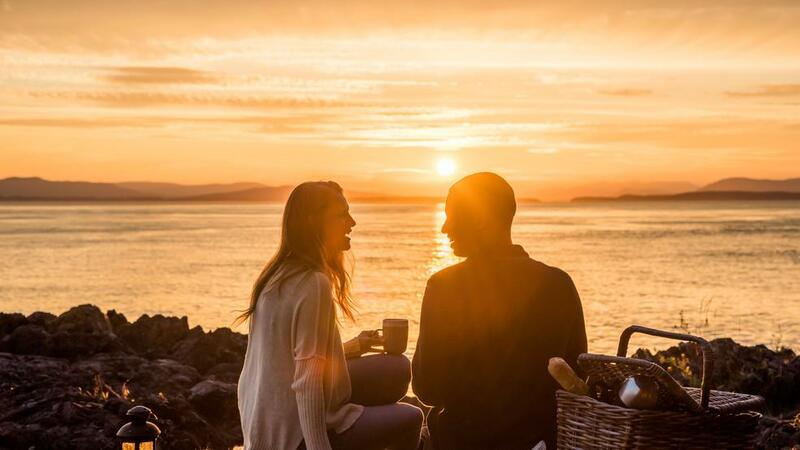 Discover serene boutique inns on Lopez Island, enjoy the romance of the historic Rosario Resort in Eastsound on Orcas Island or head to San Juan Island’s Roche Harbor to bask in the bustle of maritime culture. Different hotels, motels, lodges, cottages and inns each have their own charm and amenities ranging from bikes to hot tubs, so you should have no problem finding your perfect place to stay. Are you ready to kick back and eat up? Learn more and plan your gustatory adventure at visitsanjuans.com/savor.